Please visit these new bloggers who inspirer and share many,many ideas with us all. Okay....Now the details if you choose to participate. Nominate 15 (or what you can) fellow bloggers who are relatively new to blogging. Let them know that you nominated then. Thank the blogger that has nominated you. 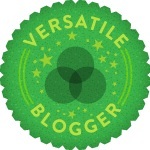 And finally....Add The Versatile Blogger Award picture to your blog post! Well there we have it..............I would like to thank Faye once again for her friendship and introducing me to many new cyber♥s....The world gets smaller and smaller the more I reach out. Thanks Debi! Will certainly be sharing this award with a few folks in my post today! Thank you for the award, Debi. Thanks so much Debi - I really appreciate the nomination and will post about it asap! Fun to find out random facts about other bloggers. You all have been wonderful as I new you would be...yes i did! aww thanks for the award debi! you are so kind! Awwwww only just seen this... thanks hun, greatly appreciated, will pop up the award now, but will have to wait to nominate as i dont have 15 to do yet lol..